Blain is not at all sure that he wants to be HOME WITH LEILA. He certainly doesn’t want to play with her, even if she is now an important part of the family. No, Leila’s not a baby sister. She’s a guide dog for Blain’s blind mother, and Leila does her job well. Too well. Blain used to be Mom’s assistant, and he resents having a dog take his place. His attempts to sabotage her help don’t work. But when Blain himself is in need of comfort, Leila comes through for him, and she even licks away his tears. Although sibling stories involving jealousy are common, this one features a cross-species relationship. Most of the children’s books about blind characters are for middle-grade readers. 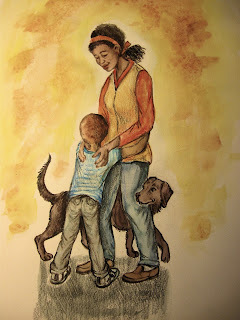 An exception, the popular picture book, HANNI AND BETH: SAFE AND SOUND, is written from the dog’s point of view. But I know the author, Beth Finke, and have heard her side of the story. Guide dogs are amazing! My short stories have been published by many magazines, including Spider, Girls’ Life, Ladybug, Highlights, etc. “The Holding-On Night,” published by Cricket, which I wrote and illustrated, won the International Reading Association Short Story Award. Two of my novels for middle-grade readers have been on master lists for state young reader awards. I’ve illustrated several of my own books and two picture books by others: IS THAT YOUR SISTER? and SOMETHING IN THE AIR. I wrote and illustrated MESS-UP MOLLY and BIG CAT AND KITTEN published by MeeGenius, now an imprint of HMH. My family is multi-racial, and I’ve created both text and illustrations that portray diverse characters. I’ve copied the first 50 words of the text and am attaching a rough sketch also. Thank you so much for this unusual opportunity to present HOME WITH LEILA for consideration. “Look, Blain. There she is,” says Daddy. I’m standing on tiptoe but still can’t see her. “We’re over here!” he shouts. Finally, I see Mommy rushing toward us. Daddy gives her a hug and kiss. Mommy looks different – her hair fluffier and her smile wider. I haven’t seen her for days and weeks. Thanks for sharing this! Please send the manuscript (and 1 illustration) to vselvaggio@windstream.net. Put "PBPITCH September Submission" in the subject line. Thank you! I have a very special guide dog in my life! Please send the query + ms + art samples to Clelia@martinliterarymanagement.com with #pbparty in subject line. Thanks! Love the illustration and premise! Please send the query, manuscript, and sample illustrations to cedarfort.submittable.com/submit. Thanks!